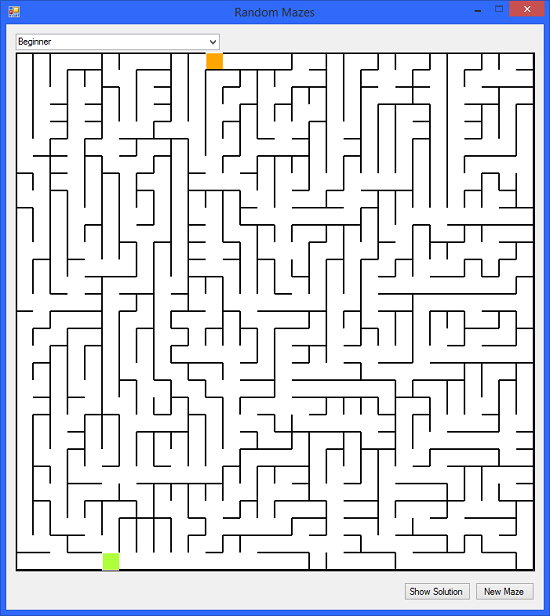 This is a maze solving game, with a maze overlay drawn on an extended (restricted) DataGridView. The DataGridView only accepts arrow key input. The mazes are created in conjunction with a 2D array, and arrow key movement through the DataGridView is limited to clear paths. Navigation is blocked where walls are drawn. The solver part of the game finds and draws a path from the start cell to the end cell. When creating a random maze, each cell starts with four walls. Given a starting cell, the maze is created with each new cell being a random spur from a random branch of the existing maze. Walls between the random maze cell and the new cell are removed. This new cell is then added to the existing maze, and the process repeats until all of the cells in the grid have been visited. Given a starting cell, each cell N, E, S, W of the starting cell (where not out of bounds, and the cell hasn't already been visited and processed) is recursively processed to assess whether it is a valid path. For each of these (potentially) four cells, the process is repeated, until a processed cell is out of bounds, in which case the solver returns false, or, a processed cell is the target cell (end point), in which case the solver returns true. Any cell returning false is discarded. Those cells returning true are added to the solution list in reverse order - end cell to start cell. Using a proven predefined algorithm, it's easy to create Random Mazes. Analyzing these Mazes with a recursive technique quickly finds the shortest clear path from start point to end point.